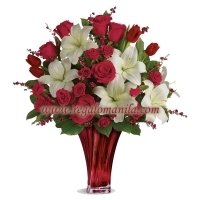 Classic romance is this radiant bouquet of red roses, crimson tulips and pure white lilies, hand-delivered in an exquisite blown glass vase. With its radiant red hue and unique twisting shape, it's sure to take their breath away! Each arrangement is hand-created using the freshest flowers so colors and varieties may vary slightly while keeping the same look of the bouquet.